Saturday, February 22 at 5:00pm // Admission is free. Reservation required. The Castillo Theatre invites you to a reading of The Acquittal by the award-winning playwright, Shahid Nadeem, (translated from Urdu by Tahira Naqvi). The reading is being directed by Castillo’s artistic director Dan Friedman and will be held on Saturday, February 22 at 5:00 p.m.
Shahid Nadeem is considered Pakistan’s foremost playwright and is the executive director of Ajoka Theatre located in Lahore. 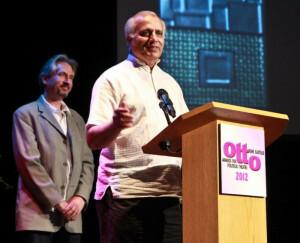 Ajoka was recognized witt a 2012 Otto Rene Castillo Award for Political Theatre. Nadeem is a socially and politically engaged artist who was imprisoned in 1969, 1970 and 1978 for his writings and opposition to military rule. Nadeem was adopted as a prisoner of conscience by Amnesty International and while he was in exile he worked for Amnesty as its International Campaign Coordinator in London and as Asia-Pacific Communications Officer in Hong Kong. Nadeem has won numerous theatre and writing awards including President of Pakistan’s Pride of Performance Award, as well as the Gursharan Singh Award for Theatre Commitment in India (2005). Nadeem is currently in the U.S. as a fellow with the National Endowment for Democracy. The Acquittal, originally written in 1987 while Nadeem was in exile in London, is the story of four women from various social strata who find themselves in the same prison cell under General Zia-ul-Haq’s Hudood Ordinances.